If you relocate your battery to a storage bin you'll have to secure it to run any autocrosses or track events. You can put the battery in the passenger side bin for better weight distribution but you lose the use of that bin and it's much easier to access from the driver seat. If I was going to do this again I would have put the battery on the passenger side. I cut the driver side bin out using a Drimmel Tool with a cutting disk. I took the stock battery pan from the engine bay, drilled two holes in it for the 5/16 inch x 5 1/2 inch battery hold-down bolts. 5 1/2 inch long bolts are just long enough for the stock battery hold-down clamp that goes across the battery. If you use a thicker after-market battery hold-down then use 6 inch bolts. I stuck the two battery hold-down bolts up through the battery pan, then bolted the pan to the bottom of the car in the driver side storage bin (see photo). I used all three of the stock bolt-down holes in the battery pan. Each of the three bolt-down locations need a different length bolt. I used a 5/16 x 1 1/2 inch long bolt for the central bolt-down, a 5/16 x 2 inch bolt for the upper right (in photo below) and a 2 1/2 inch long bolt for the upper left bolt-down. One of the holes comes pretty close to some fuel lines under the car so be careful and drill small pilot holes first. I put a lock washer and nut on the three bolts from below the car and then painted the exposed nuts with primer to seal and prevent rust. I installed a battery disconnect switch just to the right of the picture above and connected two ground wires, one to a side speaker bolt (to the right of the photo) and one to a battery pan bolt (upper left in photo). The disconnect lever is accessible when the bin is closed. 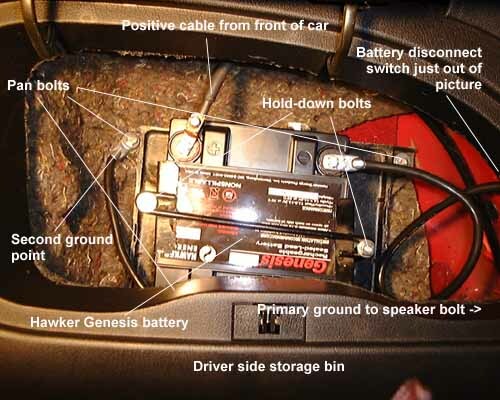 With this setup the battery is more secure than it was when it was mounted in the engine bay. I got the battery from AVT Battery, they sell the Genesis 26 amp dry battery that Pettit uses in it's TKT cars. Pettit charges $175 for it. The battery is rated at 600 cold cranking amps, is small, 6.5" X 6.9 X 4.9", light weight at 23 lbs and fits in the bin behind the driver or passenger. It cost me $89 + $17 shipping. For an extra $10 you can upgrade to a metal case. Tell the receptionist you want to place an order, she'll try to tell you that they don't sell batteries for cars.